June spent some time at the Monty Roberts International Learning Center (MRILC) for gentling and basic handling. She was halterable, but needed some time building trust and confidence. While at AAE she progressed nicely with basic handling and hoof care. Not long after arrival, little June's belly suddenly ballooned, and she delivered her colt, Johnny, on April 20, 2018. She had some down time to settle in at AAE and enjoy her lil' guy. 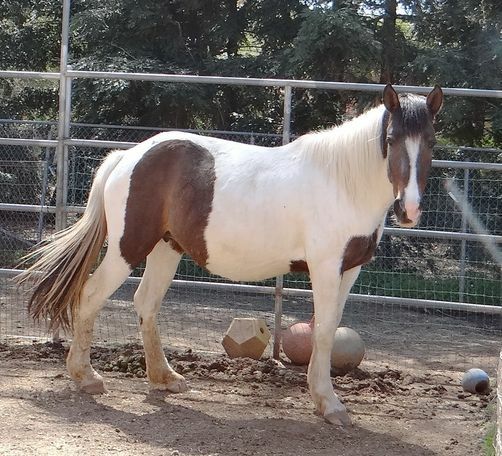 June is a sweet, gentle mare that is on the lower end of the hierarchy in a group and herd environment. She is soft and kind, while a little aloof. June is current with vaccines, deworming, and hoof and dental care, Her hooves are still a work in progress, but she did well with the farrier for her first trim. June has low fetlocks and should not be considered for more than a light riding prospect, at best.